If you have been looking for ways to use up all the zucchini in your garden, look no further than these Lemon Zucchini Muffins. If you love all things lemon, then these are a must try. It’s also a great way to sneak some veggies into your kids. 🙂 If you need more ways to use up extra zucchini, you can also try my chocolate zucchini muffins or my fudgy flourless brownies. 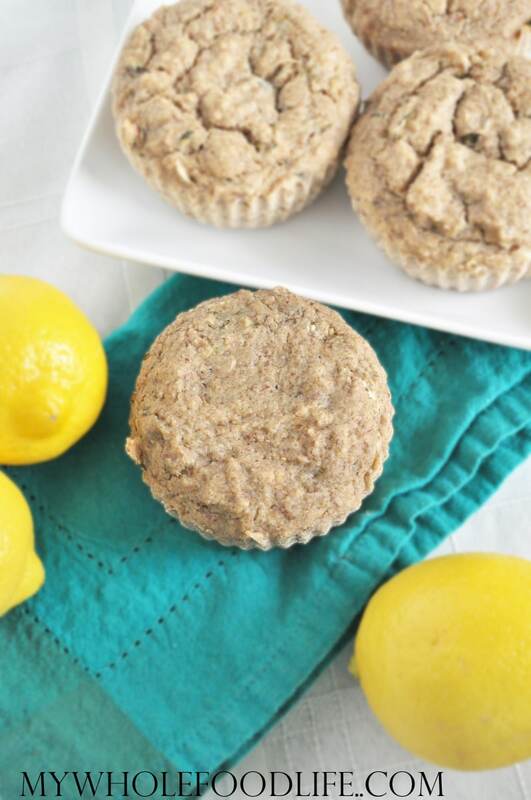 These lemon zucchini muffins are vegan, gluten free and bursting with lemony flavor. If you love all things lemon, you may also want to check out my Lemony Cookie Dough Bites or my Flourless Lemon Cookies. A healthy muffin bursting with lemony flavors! In another bowl , add the wet. Spoon batter into muffin pans . I use silicone liners and did not need to grease. If you use paper liners, you will need to grease them. Let cool before removing from the muffin pans. Once completely cool, store in an airtight container in the fridge. These should last a couple weeks in the fridge. You can also freeze them for up to 6 months. Enjoy! So stinkin excited to see this recipe! After making your lemon poppyseed muffins I cannot wait to try these! I do have a few questions. Can use half sorghum flour and half oat flour? And if i dont have enough applesauce do i use coconut oil or just regular almond milk to add moisture? Great thank you! I bought sorghum and millet flours this week and have been dying to use them in recipes. I love oat flour but sometimes my baked goods come out heavier than I like. Not sure if its the flour or just me as a rookie baker. LOL Have you ever used Millet flour? Why do you not use xanthum gum? Just curious as I am trying to learn more about gf, vegan baking. Hi Melissa, I made these today because my friend highly recommended them and her whole family loved them. I followed your recipe exactly, except for substituting eggs for the flax eggs. The muffins did not turn out well at all, they are basically inedible. I had to cook them over 20 minutes to get them fully cooked and not wet. I always thought that you could substitute eggs for flax eggs and vice versa. I can't think of anything else it could be, because I followed the recipe exactly. Thoughts? Hi Rachel! I am so sorry they didn't turn out for you. :( Regular eggs for flax eggs should not have made a difference. Did you squeeze the excess moisture out of the zucchini before using in this recipe? Larger zucchinis hold more water than the smaller ones. Maybe that was it- I used a huge zucchini. It didn't seem super wet so I didn't squeeze it out, but that probably was my mistake. Thanks for the reply, I'll try the recipe again and squeeze it out really well!! Can I use almond flour in place of oat flour? I haven't tried to say for sure. If you try, I would add an extra egg or two.